`wound and wound'. Also a basket hung over the back of a chair, in which he vainly tried to hoist his too confiding sister, who, with feminine devotion, allowed her little head to be bumped till rescued, when the young inventor indignantly remarked, "Why, Marmar, dat's my lellywaiter, and me's trying to pull her up." Though utterly unlike in character, the twins got on remarkably well together, and seldom quarreled more than thrice a day. Of course, Demi tyrannized over Daisy, and gallantly defended her from every other aggressor, while Daisy made a galley slave of herself, and adored her brother as the one perfect being in the world. A rosy, chubby, sunshiny little soul was Daisy, who found her way to everybody's heart, and nestled there. One of the captivating children, who seem made to be kissed and cuddled, adorned and adored like little goddesses, and produced for general approval on all festive occasions. Her small virtues were so sweet that she would have been quite angelic if a few small naughtinesses had not kept her delightfully human. It was all fair weather in her world, and every morning she scrambled up to the window in her little nightgown to look our, and say, no matter whether it rained or shone, "Oh, pitty day, oh, pitty day!" Everyone was a friend, and she offered kisses to a stranger so confidingly that the most inveterate bachelor relented, and baby-lovers became faithful worshipers. "Me loves evvybody," she once said, opening her arms, with her spoon in one hand, and her mug in the other, as if eager to embrace and nourish the whole world. As she grew, her mother began to feel that the Dovecote would be blessed by the presence of an inmate as serene and loving as that which had helped to make the old house home, and to pray that she might be spared a loss like that which had lately taught them how long they had entertained an angel unawares. Her grandfather often called her `Beth', and her grandmother watched over her with untiring devotion, as if trying to atone for some past mistake, which no eye but her own could see. Demi, like a true Yankee, was of an inquiring turn, wanting to know everything, and often getting much disturbed because he could not get satisfactory answers to his perpetual "What for?" "What makes my legs go, Dranpa?" asked the young philosopher, surveying those active portions of his frame with a meditative air, while resting after a go-to-bed frolic one night. "It's your little mind, Demi," replied the sage, stroking the yellow head respectfully. "What is a little mine?" "It is something which makes your body move, as the spring made the wheels go in my watch when I showed it to you." "Open me. I want to see it go wound." "I can't do that any more than you could open the watch. God winds you up, and you go till He stops you." "Does I?" And Demi's brown eyes grew big and bright as he took in the new thought. "Is I wounded up like the watch?" "Yes, but I can't show you how, for it is done when we don't see." Demi felt his back, as if expecting to find it like that of the watch, and then gravely remarked, "I dess Dod does it when I's asleep." A careful explanation followed, to which he listened so attentively that his anxious grandmother said, "My dear, do you think it wise to talk about such things to that baby? He's getting great bumps over his eyes, and learning to ask the most unanswerable questions." "If he is old enough to ask the question he is old enough to receive true answers. I am not putting the thoughts into his head, but helping him unfold those already there. These children are wiser than we are, and I have no doubt the boy understands every word I have said to him. Now, Demi, tell me where you keep your mind." There might have been cause for maternal anxiety, if Demi had not given convincing proofs that he was a true boy, as well as a budding philosopher, for often, after a discussion which caused Hannah to prophesy, with ominous nods, "That child ain't long for this world," he would turn about and set her fears at rest by some of the pranks with which dear, dirty, naughty little rascals distract and delight their parent's souls. "No more raisins, Demi. They'll make you sick," says Mamma to the young person who offers his services in the kitchen with unfailing regularity on plum-pudding day. "Me likes to be sick." "I don't want to have you, so run away and help Daisy make patty cakes." 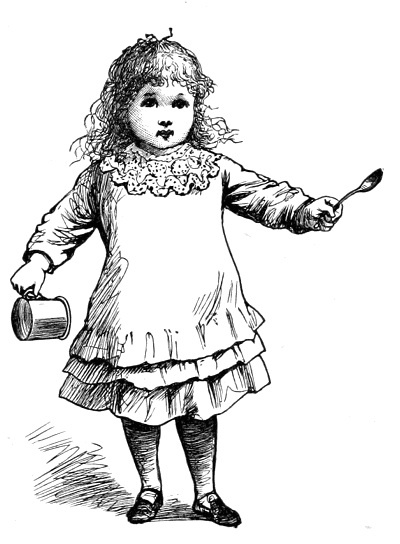 "Now you have been good children, and I'll play anything you like," says Meg, as she leads her assistant cooks upstairs, when the pudding is safely bouncing in the pot. "Truly, Marmar?" asks Demi, with a brilliant idea in his well-powdered head. "Then we'll go and eat up all the raisins." Aunt Dodo was chief playmate and confidante of both children, and the trio turned the little house topsy-turvy. Aunt Amy was as yet only a name to them, Aunt Beth soon faded into a pleasantly vague memory, but Aunt Dodo was a living reality, and they made the most of her, for which compliment she was deeply grateful. But when Mr. Bhaer came, Jo neglected her playfellows, and dismay and desolation fell upon their little souls. Daisy, who was fond of going about peddling kisses, lost her best customer and became bankrupt. Demi, with infantile penetration, soon discovered that Dodo like to play with `the bear-man' better than she did him, but though hurt, he concealed his anguish, for he hadn't the heart to insult a rival who kept a mine of chocolate drops in his waistcoat pocket, and a watch that could be taken out of its case and freely shaken by ardent admirers. Some persons might have considered these pleasing liberties as bribes, but Demi didn't see it in that light, and continued to patronize the `the bear-man' with pensive affability, while Daisy bestowed her small affections upon him at the third call, and considered his shoulder her throne, his arm her refuge, his gifts treasures surpassing worth. Gentlemen are sometimes seized with sudden fits of admiration for the young relatives of ladies whom they honor with their regard, but this counterfeit philoprogenitiveness sits uneasily upon them, and does not deceive anybody a particle. Mr. Bhaer's devotion was sincere, however likewise effective--for honesty is the best policy in love as in law. He was one of the men who are at home with children, and looked particularly well when little faces made a pleasant contrast with his manly one. His business, whatever it was, detained him from day to day, but evening seldom failed to bring him out to see--well, he always asked for Mr. March, so I suppose he was the attraction. The excellent papa labored under the delusion that he was, and reveled in long discussions with the kindred spirit, till a chance remark of his more observing grandson suddenly enlightened him. "Father, Father, here's the Professor!" Down went the black legs and up came the gray head, as the preceptor said, with undisturbed dignity, "Good evening, Mr. Bhaer. Excuse me for a moment. We are just finishing our lesson. Now, Demi, make the letter and tell its name." "I knows him!" And, after a few convulsive efforts, the red legs tok the shape of a pair of compasses, and the intelligent pupil triumphantly shouted, "It's a We, Dranpa, it's a We!" "He's a born Weller," laughed Jo, as her parent gathered himself up, and her nephew tried to stand on his head, as the only mode of expressing his satisfaction that school was over. "What have you been at today, bubchen?" asked Mr. Bhaer, picking up the gymnast. "Me went to see little Mary." "And what did you there?" "I kissed her," began Demi, with artless frankness. "Prut! Thou beginnest early. What did the little Mary say to that?" asked Mr. Bhaer, continuing to confess the young sinner, who stood upon the knee, exploring the waistcoat pocket. "Oh, she liked it, and she kissed me, and I liked it. Don't little boys like little girls?" asked Demi, with his mouth full, and an air of bland satisfaction. "You precious chick! Who put that into your head?" said Jo, enjoying the innocent revelation as much as the Professor. "`Tisn't in mine head, it's in mine mouf," answered literal Demi, putting out his tongue, with a chocolate drop on it, thinking she alluded to confectionery, not ideas. "Thou shouldst save some for the little friend. Sweets to the sweet, mannling." And Mr. Bhaer offered Jo some, with a look that made her wonder if chocolate was not the nectar drunk by the gods. Demi also saw the smile, was impressed by it, and artlessy inquired. ..
"Do great boys like great girls, to, 'Fessor?" Like young Washington, Mr. Bhaer `couldn't tell a lie', so he gave the somewhat vague reply that he believed they did sometimes, in a tone that made Mr. March put down his clothesbrush, glance at Jo's retiring face, and then sink into his chair, looking as if the `precocious chick' had put an idea into his head that was both sweet and sour.